Artists as Public Programmers? Machine Project excels. 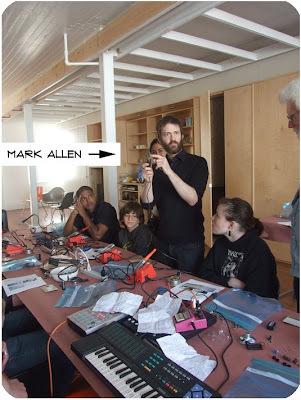 "Learn to solder in this three hour long workshop presented by the amazing Mark Allen of Machine Project fame. 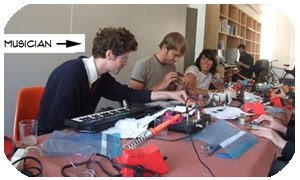 Participants will learn to solder by building a primitive synthesizer. During the workshop the band ing will play music to solder by. As people get their synths working, they will join ing in playing some simple repeating musical patterns. 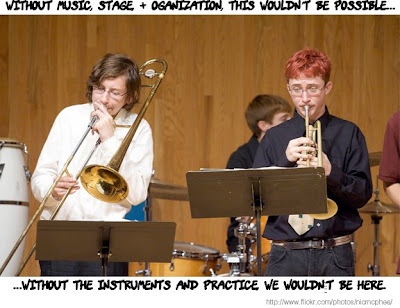 At the end of the workshop everyone will play a simple and inevitably out of tune musical piece together." We took all our instruments & "jammed" as a group with a real-live musician. All done in a simple, constrained but fun steps. It was geared towards a positive outcome in an informal vibe. It was so much fun, and I couldn't stop laughing. Then I brought my "instrument" home, and my 17 year old stepson couldn't get enough of playing with it. So I ordered a couple of kits online for him too. The above sounds simple, but I've taken a number of these types of classes over the years. This was the first time it really... worked. Mark has given this particular one over a dozen times to iterate & refine. If you'd like to learn how to be a master at a maker class, take one of his. Justine Roberts just forwarded an article from yesterday's Christian Science Monitor: Museums' New Mantra: Connect with Community. We are thrilled for the museum community, our clients and of course, ourselves that the idea of museums as community centers continues to get out to an increasingly broader audience (though I was surprised by the omission of Nina Simon from the article-- her work was cited however, if not name). 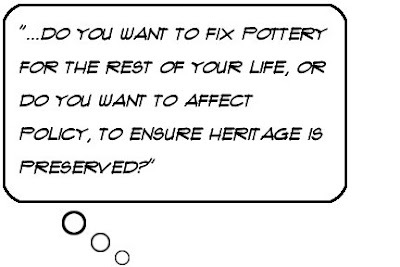 The trajectory of museums has not been one of a lack of community engagement or reflection, it's just that it takes a while for institutions to catch up to societal changes such as 2.0. I believe that museums in the 19th and 20th centuries did a fabulous job of educating and sharing to the best of their abilities and in the context of their time. This article is evidence of more of the same on their behalf. As I've said before, my personal wish is that museums can retain their voice (which is a very well-informed one) while providing room for the creations, perspectives, and voices of the public to foster greater understanding and surprise for both. It is this informed and gently shaped "collaboration" that is the key to serving the public. 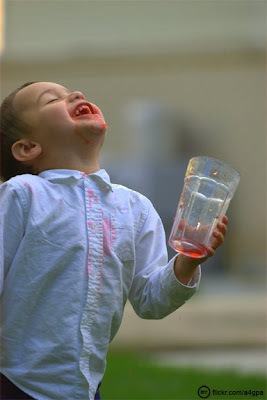 So drink up, people, and have fun. I came across an article in the Jamiacan Gleaner called "Changing People's Lives" about the new head of Anthropology at the Horniman Museum & Gardens in London. His name is Wayne Modest, and he's from Jamaica, and yes, he has dreadlocks. Interesting, eh? For me the intriguing point was the moment in his [impressive] career where the quote comes from. Wayne was studying conservation methods abroad. He noticed they were not suitable for the Caribbean environment. At the same time, a mentor asked him the above question– the real news are the conservation standards he helped put in place in his home country. It got me to thinking about what are other key insights that are supported by mentors, family, or simple incidents that help breakthroughs happen? Do you have such a moment or a person in your past or present? Have you been a mentor?? Museums are about shared knowledge, so I imagine there may be interesting stories out there. I'd love to hear yours. Cooperative Authority ...in the News? In the wake of some terrific and interesting press on museums and social participation, I thought it was time to stop being so busy at work and wade in. Yes, everyone wants to coin their own phrase. Well, so do I. I've been hearing a lot about this idea of the "visitor as publisher" (or user) and the "we" vs. the "you" movement away from the museum as the authority and the visitor the uninformed. Museums ARE authorities in many topics, so naturally the public looks to them for leadership in that regard. They want us to help curate the information, and interpret the data-- to some extent. The key is leaving room for their voice to expand the experience. The ultimate challenge is how to make the result meaningful. This is a collaborative model, and the authority lies in the building of knowledge between two entities- resulting in something more powerful than either could do on their own. Hence my phrase, cooperative authority. Because I can't see how you can say you're an institution of X or Y without being somewhat of an authority. For a decade or more we've been working on a number of projects that support this aim- with various iterations. In the coming days I'll profile a bit about what we've done, and what's in the hopper. Stay tuned, and please let me know what you think. I'm trying this phrase out. News from Iceland: birds inject hope? 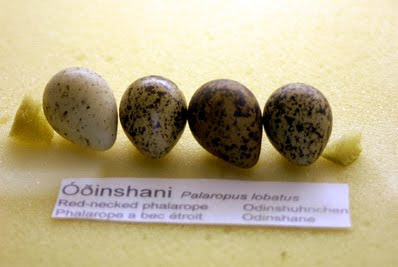 One of my favorite museums was Sigurgeirs Bird Museum (in Icelandic known as Fuglasafn Sigurgeirs)- a family owned and operated shrine to their late brother's incredible bird collection. This museum is located in the beautiful, but somewhat remote Lake Mývatn district. "The primary aim of the foundation is to enhance and strengthen cultural and humanitarian activities in Iceland and abroad. Emphasis is focused on supporting projects that can make a difference, that inject hope and optimism into a community." After having seen the museum and met the hard-working director, I can see that such a project would inject great hope and awe into the lakeside community it lives in. More about it to come. Image courtesy of the Aurora Foundation.